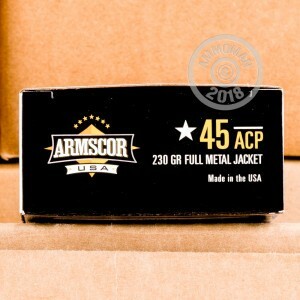 This 1,000 round case of .45 ACP ammunition from Armscor delivers quality target shooting at a highly affordable price. Buy this case or any combination of items totaling $99 or more to get free shipping from AmmoMan.com! 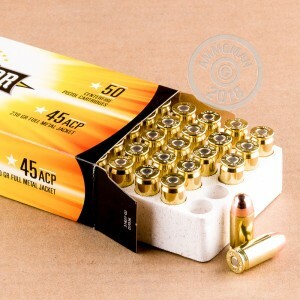 Each cartridge in this case fires a heavy 230 grain full metal jacket bullet at 830 feet per second. This standard pressure load works well for range use in a wide variety of handguns including full-size 1911s and compact concealed carry pistols. 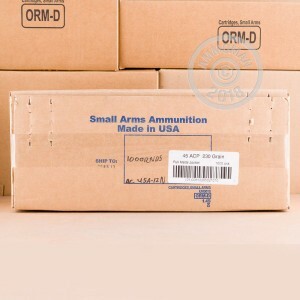 This ammo is loaded by Armscor's US division, which is located in Montana and Nevada. It uses non-corrosive Boxer primers and reloadable brass cases.